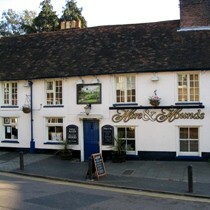 The Hare and Hounds in St Albans is a reasonable size pub in a back street a couple of minutes walk from the main city centre. Seating is mostly to left and back right where there is a games room type area with table football, dartboard and juke box. The regulars seem to consist mainly of middle-aged men standing around the front bar area keeping an eye on whatever sport is on the tv. Small prints of paintings by local artists hanging on walls. Wi-Fi is provided by The Cloud. This pub is a little more lively than the peaceful place depicted on the impressive website. Service is good and bar staff were friendly and welcoming at the time of the review. Food looks tempting and is sourced from local suppliers. Good selection of real ales consisting of Timothy Taylor Landlord, Wadworths 6X and Adnams Broadside.